How is your Chief & Council doing? We did a quick survey and the results are very interesting – but we sure would like your input too! It would seem that 71% of Members never hear from their Chief & Council…is that consistent with your experience? 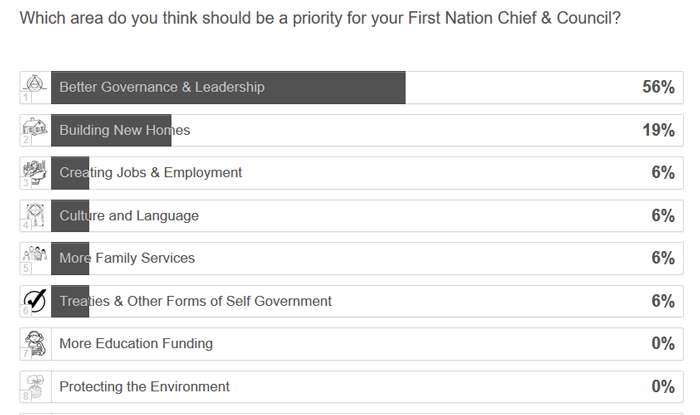 Interestingly, it would also seem that Better Governance & Leadership (56%) is the highest priority and zero percent (0%) see their Leaderships role as stewards and protectors of the environment – What Do You Think? Complete the quick survey in this post…results will be shared next week. What are your thoughts? We would love to hear from you. Complete the survey in this post and stay tuned for results next week! At OneFeather we believe that Nation Building is about transformative change that can only occur when Leadership and Members are able to align their vision for the future. We invite you to use our services and technologies to engage your Members in more useful and powerful ways…including over 20 years’ experience delivering elections, referendums and ratification votes. We exist to help Chief & Council build a great First Nation! Let us demonstrate our solutions…we would love to visit your community. Visit www.onefeather.ca or contact Lawrence Lewis directly at (250) 889-1582. It has to be said that the Indian Act enables Band Councils, once elected, to have free reign over decisions affecting their members, without consult. In other words, they are the power and are not answerable to the membership. They cannot be removed either, until the next election. As for your survey, it covers very little and would not be useful for it’s lack of depth in current issues that on reserve members are facing. It is true that Chief & Council are not legally obliged to be answerable to their Members under the Indian Act until the next election…but then again neither are your MLA or MP…or the Prime Minister for that matter. However, that is not the point. Regardless, politicians should create and implement policies, programs and services based on public feedback, priorities and other measures. Failing to take public input into consideration is a recipe not not only disastrous public policy and decisions, but a short lived political career. I spend a lot of time working with Aboriginal communities and understand them very well and intimately…Chief & Councils need to spend more time and energy engaging and seeking community Member input for the benefit of all their Members, not be cause they have to…but because they should! My band is doing great! They share surplus from resources with the members & do everything to promote healing & success for members’ futures. The council has held meetings to survey members about what’s important & family wellness ranked very high, which is a fundamental start to community. Awesome – so glad to hear it! I agree…it is a far more complicated world today, and our peoples are now far more diverse and have new modern expectations that do require a complete rethink about how First Nation leaders engage and consult, and build their Nations. Great thoughts – thank you for sharing! I tried…hope all is well at home. I miss ALIB! the very understanding that the INdain Act is in support of First People,.. gives a false understanding that First people mis understand their own,.. far from reality! Not one policy initiative ever support a Chief and Council ,C&C when they create a structure that implements and protect the lands for the very future that feeds them, like the so-called seven generation ruler,.. yet lacks respect from the Department of Aboriginal Affairs to provide legal services to up-hold and support claims! Instead, they practice submitting legal threats to overt open respect to maintain the landbase in that manner that support such needs! that is one of un-told traditions mis understood and bullied by the Canadian institutional Aboriginal Affairs branch of the Canadian polite policy support! Wasn’t more than twenty year ago First People were in the highest courts in Canada to prove we are here in real person, as Shuswap, Nishga, Cree, or who ever they are to believe themselves to be! with every “mis-guided support” to suggest that the Indian Act is there for us,.. why can’t the Government of Canada meet us in the International Courts of the UN while we’re protected by the UN armies to understand a true meaning of respect,… quit pointing guns at our women and elders, pepper spraying pregnant ladies and using U.S.A army snipers to shot rubber bullets to shot at the region of the kidneys of young warriors & boys praying for protection of future of the land that water and wildlife is held in balance of each other! the full C&C understanding won’t do any one good if Canada doesn’t respect the true implementation of any of the full range of protection, that is always been echo-ed since we all had to prove we exist, back since 1997, forward! time to think more than a survey to force us agaisnt each other,..